Dr. Stockmann attempts to expose a water pollution scandal in his home town which is about to establish itself as a spa. When his brother, the mayor, conspires with local politicians and the newspaper to suppress the story, Stockmann appeals to the public meeting - only to be shouted down and reviled as 'an enemy of the people'. 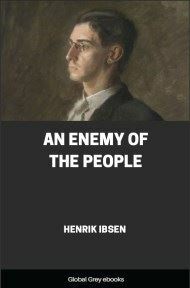 Ibsen's explosive play reveals his distrust of politicians and the blindly held prejudices of the 'solid majority'.